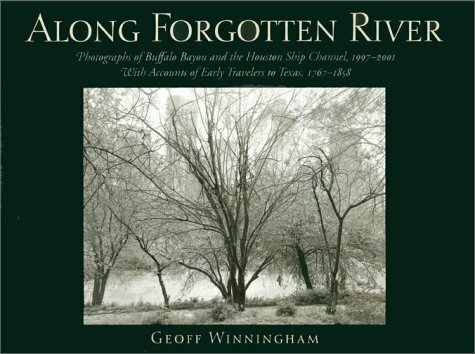 For more than five years award-winning photographer Geoff Winningham explored and photographed Buffalo Bayou, the Houston Ship Channel, and the landscape he found along the way. He revisited sites of historic importance, such as Allen’s Landing, where the city was founded in 1836, and the San Jacinto Battlefield, where Texas won its independence in the same year. Winningham has also sequenced eighty of his striking, large-format black-and-white photographs, following Buffalo Bayou from its source in the Katy Prairie through the suburbs and into the inner city of Houston. From there, his stunning duotone photographs follow the bayou east to its confluence with the San Jacinto River, where it becomes the Houston Ship Channel, crosses Galveston Bay, and enters the Gulf of Mexico. As a counterpoint to his photographs, Winningham has edited and sequenced passages from the written accounts of Spanish friars and itinerant preachers, prospective settlers, refugees, adventurers, exiles, and naturalists. Dragonflies of Texas is the definitive field guide to these insects. It covers all 160 species with in situ photographs and detailed anatomical images as needed. Each species is given a two-page spread that includes photographs of both sexes and known variations when possible, key features, a distribution map, identification, discussion of similar species, status in Texas, habitat, seasonality, and general comments. Many of the groups also have comparative plates that show anatomically distinctive characteristics. In addition to the species accounts, John Abbott discusses dragonfly anatomy, life history, conservation, names, and photography. He also provides information on species that may eventually be discovered in Texas, state and global conservation rankings, seasonality of all species in chronological order, and additional resources and publications on the identification of dragonflies. The authors draw on their lifetime of experience to present a thorough introduction and discussion of the migrant and resident birds of this region. by John Tveten and Gloria Tveten. In this easy-to-use field guide, the Tvetens describe and illustrate more than 100 species of butterflies that live in Southeast Texas and can often be found across the state. Each chapter serves as both a navigational aid and an interpretive guide to old native homesteads, untouched prairies, deep forests, wetlands, wildlife preserves along the Great Texas Coastal Birding Trail, and scenic bayous and waterways in and around the Bayou City. by B. C. Robison and John L. Tveten. 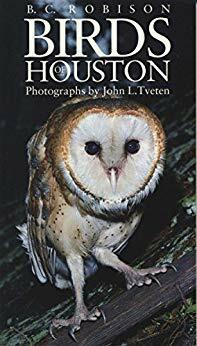 Nature writer B. C. Robison and wildlife photographer John Tveten have teamed up to produce this field guide for birders who want to identify the birds most commonly seen in Houston. Fifty-five species are included, ranging from such well-known favorites as the mockingbird and cardinal to the more exotic yellow-crowned night heron. A full-color photograph for each bird appears alongside warm and often witty description. For quick reference, a summary of the primary field marks of the adult bird is also provided. This summary includes not only identifying features of the bird but also its habitats, the time of year it can be found, and its distinctive behavioral traits. Aimed at the beginning birder, the guide also gives tips on buying binoculars and on attracting birds to your yard.